On the evening of January 22, 2019, the waning gibbous moon – fresh from a lunar eclipse – and the star Regulus in the constellation Leo the Lion will be rising over your eastern horizon in the hours after sunset. To know more precisely when the moon and Regulus will rise in your sky, check out the links on our sky almanac page. 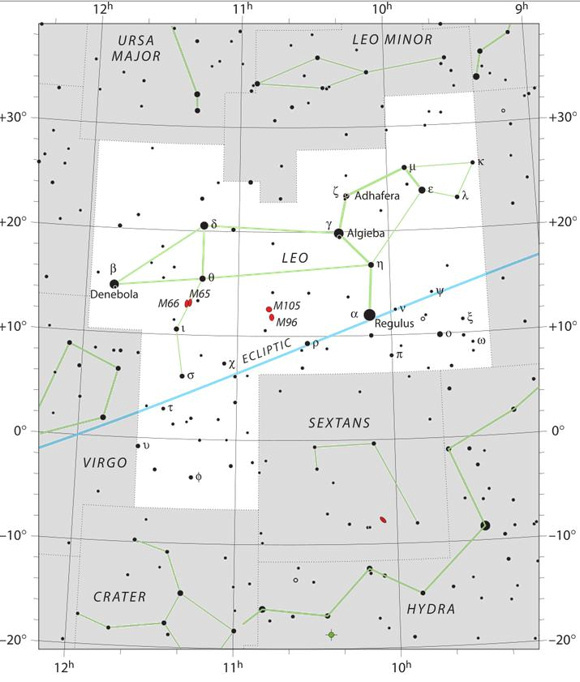 Sky chart of the constellation Leo the Lion via the International Astronomical Union. Regulus is the closest 1st-magnitude star to the ecliptic – the sun’s annual pathway in front of the constellations of the zodiac. Although the moon turned full, and passed through the Earth’s dark umbral shadow, on the night of January 20-21, the moon may still appear full to your eye tonight. Technically speaking, however, it’s a waning gibbous moon (less than 100 percent illuminated), rising in the east after sunset on January 22 and setting in the west after sunrise on January 23. Read more about the daytime moon. Want to know how much of the moon’s disk is illuminated by sunlight right now or for some chosen date and time? Click here. Want to know which constellation of the zodiac the moon is traveling in front of right now or for some chosen date and time? Click here. Regulus ranks as a 1st-magnitude star and is the 21st-brightest star to light up the nighttime sky. 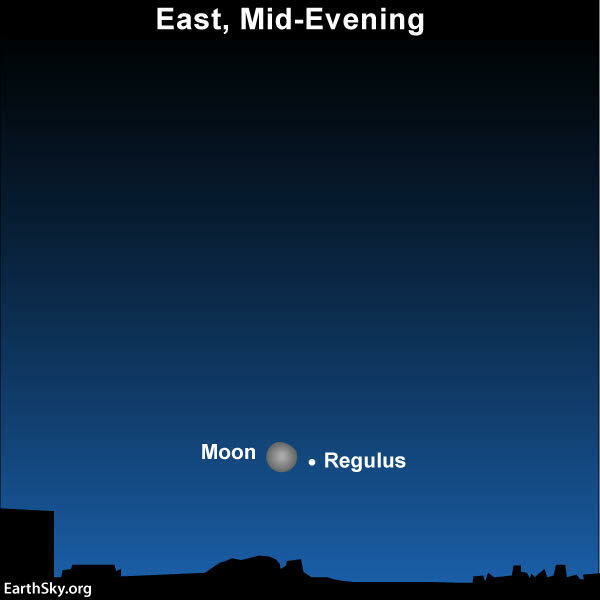 Even so, you might have difficulty seeing Regulus in the moon’s glare on January 22. After all, the moon will pass a scant 2 1/2 degrees north of Regulus on this night at 7:41 p.m. Central Time (or on January 23 at 1:41 UTC). If you have trouble seeing Regulus, simply wait another few days. 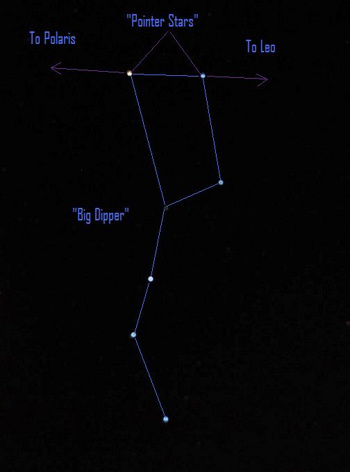 When the moon drops out of the evening sky, you can always use the pointer stars of the Big Dipper to help guide you to Regulus and the constellation Leo the Lion. At a distance of about 77 light-years, blue-white Regulus is a much younger, larger and hotter star than our sun. 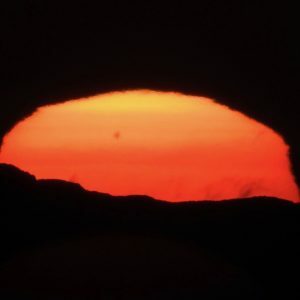 Although it looks like a single star to the eye alone, astronomers assure us that it’s actually a multiple star system, consisting of several component stars. Regulus spins once on its rotational axis in less than 16 hours, in contrast to our own sun’s spin rate at its equator of 24 days. If Regulus rotated much more rapidly, this star would rip apart! Astronomers suspect Regulus’ companions might be responsible. 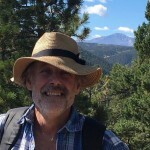 Bottom line: On January 22, 2019, let the waning gibbous moon be your guide to the star Regulus, the brightest star in the constellation Leo the Lion.